This is one of those pasta dishes that you can prepare when you don't have much time in the kitchen, yet are not comfortable with using store bought sauces. Pesto is like our chutney - just put the ingredients in the grinder and half your job is done. (Strictly speaking, however, pesto is prepared using a mortar and pestle). I chose mint and spinach because they were both sitting in my fridge and I wanted to use them up. Last week I got this H-U-G-E (if you've seen it you'll know what I mean) packet of spinach from Costco (what was I thinking), because spinach is good for health and I've been using it in many of my dishes (hoping husband dear doesn't get fed up of it). I also added mushrooms and peas for some extra taste and fiber. Cook pasta according to package instructions - Bring water to boil, add some salt and oil, pour pasta into it and cook. Meanwhile grind spinach, mint, nuts [ I used macademia because there was a brand new box of roasted, salted macadamia in my pantry, again from Costco. You could use almonds or pine nuts and lightly toast them before adding]. Add cheese. I used a couple of Kraft Singles cheese slices but you could use mozzarella or whichever you have. Grind to form a smooth [or if you wish, coarse] paste. Drain the pasta. Reserve 1/2 cup of water. In a deep bottomed pan, heat 1 tbsp oil. Roast chopped garlic. Add chopped mushrooms and sauté for a few minutes. 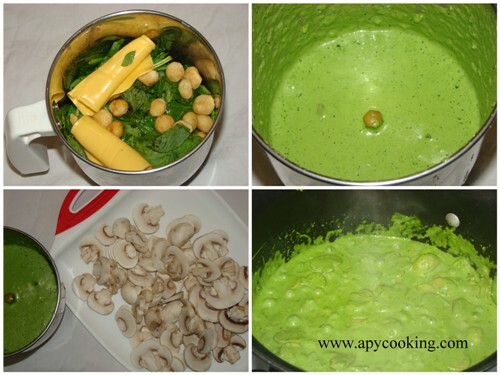 Add green peas. To this add the ground paste and reserved pasta water. Bring to a light boil. Pour in cooked pasta and mix throughly. Sprinkle pepper. Add salt to taste and mix well. My son laps it up calling it green pasta. When he grows up he'll know. This goes to Presto Pasta Night, started by Ruth. 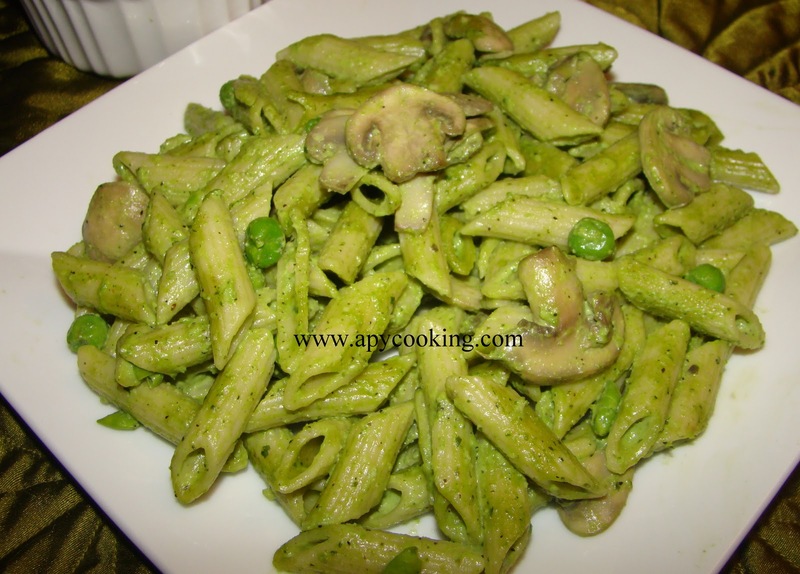 Pasta looks inviting..liked the pesto..looks so refreshing! 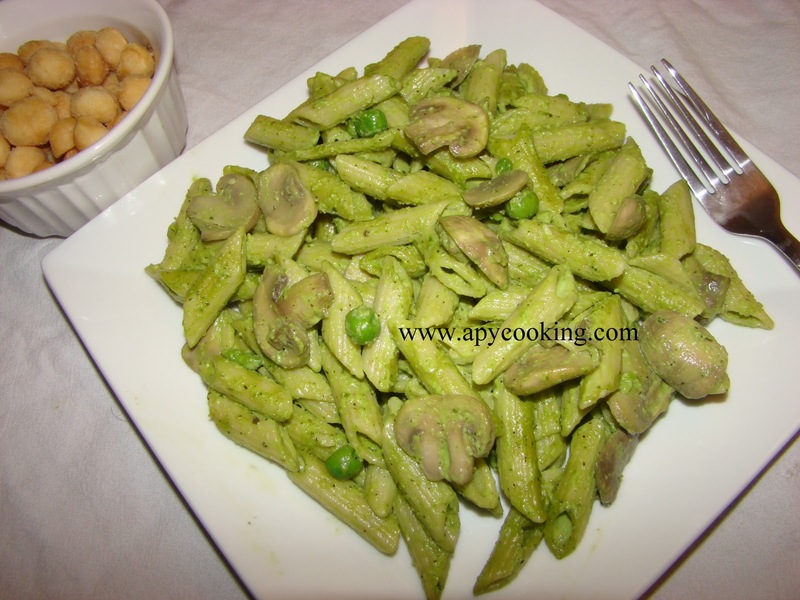 so healthy and delicious pasta !! Yummy and delightful pasta..nice one dear. yum! looks fresh, delicious and healthy! Looks great - thanks for participating this week in PPN! Looks wonderful. Thanks for sharing with Presto Pasta Nights. I'm looking forward to trying some myself. Brilliant color and taste as well, I'm sure. Your son's getting his spinach and loves it too. Looks great except for those processed cheese slices. I'd probably try it with some real cheese, like parmesan or something.